Austin Marathon Starting Line… Ready Set Go! Short story: So last week I finished a marathon. 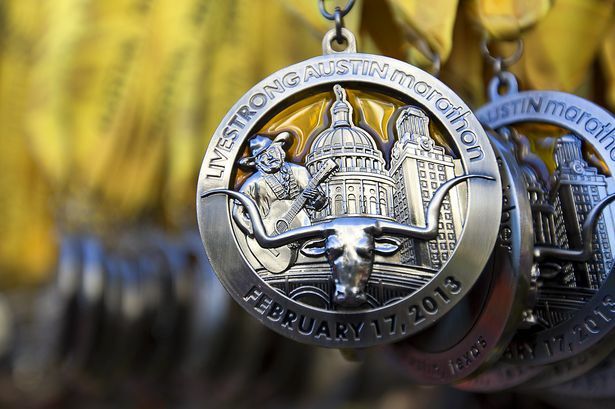 The Austin Marathon. Who would have believed it? Not me. I executed my plan and it worked out, doing 10:07 min miles all the way to a nice 4 hour, 24 minute, 21 second overall time (10:05 min/mile pace). Long story: Going in to this race I knew my training was spot on, and after the Rogue 30km race I knew what pace to shoot for. The big question was if my right calf was strong enough to take me thru. It had been hurting off and on since mid January so I had no idea what to expect. Would I only make it 2 miles? Would it not even be an issue? Or something in between? One thing I did was put a small insert in my shoe to keep the heel elevated slightly (thanks CoolRunning.com). The pre race went perfectly. I made certain to have bananas in house for my breakfast this time! I also bought 5 or 6 gels. Got downtown with almost no difficulty and was thru the restroom and on the starting line eating my gel bloks 15 mins early. I had a plan to take in lots of carbs today. We made it across the starting line 10 mins after the gun and my pacers were already ahead of me. I reeled them in and stayed more or less even with them. I would lose ground to them at every water stop and catch up again before the next one. The first 8 or 9 miles were uneventful. Just running along, enjoying the sights, watching people. Then I hit mile 10 and suddenly I started to feel a tightening or something in my right calf. I was not happy with this. I had to make it to mile 18 and get my Peanut Butter Gu gel from Joel and Leah and this calf stopping me would not do! I tried a few things and changed up to a very short fast stride for awhile. This seemed to help, but I still was feeling the cramping or pulling or something. We quickly reached the point where the half marathoner’s cut right and we went left. I almost thought of…. nahhh. First thing after we split off are two miles of fairly steep hills. “So many hills, my calf doesn’t like them.” I just kept chugging along with short fast steps and seemed to hold off any more pain. Once it flattened out things got better. I don’t even think my calf was an issue after mile 15; it just seemed to fade into the background. From there on everything went smooth. Just stay with my pace group. Early in the race I had to force myself to not get too far ahead of them, but later I really couldn’t. There were so many people cheering from mile 16 on it was great. People giving us oranges, bananas, cupcakes (I had to have a chocolate one!) candy, grapes… so wonderful. Saw Joel and Leah at mile 18+ and got a PB Gu gel! Shortly after that we hit mile 20. I started worrying. Is this when you hit the fabled “Wall”? What’s gonna happen? My race plan was to start off slow and take in lots of carbs to make sure my body didn’t run out of carbs and hit the wall. And my plan worked. Whatever this wall thing is, if I hit it I didn’t notice. I really tried to pour on some speed the last 3 miles. I think I did one in 9:30. But I really couldn’t put any space between me and my pace group. Mile 24 was a bit tragic, as I saw a runner twist his ankle badly. He tried to hop on but sadly I doubt he finished. I felt really bad for him. 800m to go and there is one last big steep hill. More hills? Really? I have proof! Where did they get this thing from? Okay, chuga, chuga, chuga, chuga, choo choo, made it up, and then… I had to go down a hill. At this point I really just wanted flat pavement to lessen the chance of any cramping or tripping or of my calf finally giving in. Made it to the bottom and I was at the finish line! Woohoo!!!!!! Made it. There are no limits! And now the highlight of the day: my favorite pacer, the guy who saved me from certain doom at the Rogue 30k and who I thanked profusely at the expo yesterday, and who I ran with all day today… he gave me the pace sign! Greatest marathon souvenir ever! Only 20 pace signs and 20,000 people and I’m sure most pacers keep them…. People kept thanking me for pacing after that and I kept explaining my story about how it was my first marathon and he gave it to me. They all said 4:25 was a really good time for a first marathon. That was nice of them. Next year I hope I can do 4:00. … but this isn’t proof. 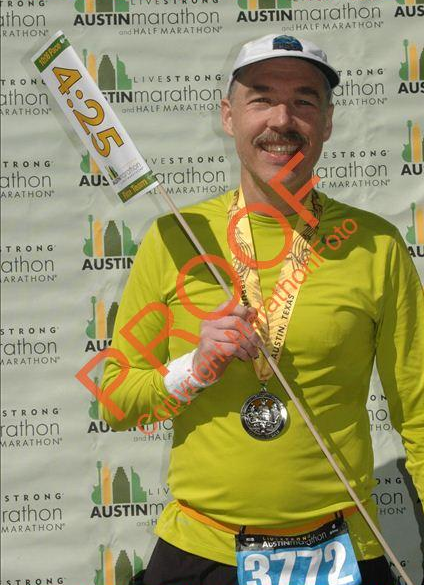 After finishing my calf was really tight and I had to limp to the Austin Runner’s Club food tent. But after a bit, I walked around, stretched it out and was able to walk fairly well. And I parked 10 blocks from the finish so I had lots of time to stretch it out. So yeah. I did it! Marathon Man is me. I really can’t believe it. So what next? No running for bit. Probably a lot more biking and swimming in my near future. Two days after my mind is still on the marathon… I keep thinking: “From Zero to 26.2 in 18 months!” I’m still amazed. Hard to believe I couldn’t run a full lap 18 months ago. “Just skate it off, you’ll be fine” – what I was thinking when my calf started hurting. I’m sure my dad remembers all the hockey coaches (and probably him too) saying that to us players when we got hurt. 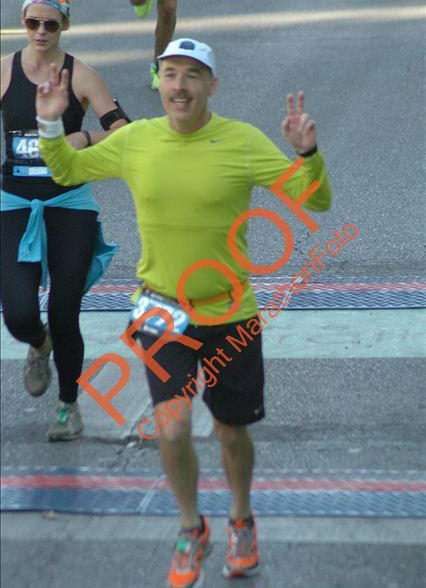 “From Zero to 26.2 in 18 months” – yes, I came up with that phrase, around mile 20. One more quote, from around mile 10 where my calf started tightening up: “If I can just make it to mile X I can walk the rest if I have to!” I was going to finish no matter what. Who knows maybe something here will help or inspire someone! 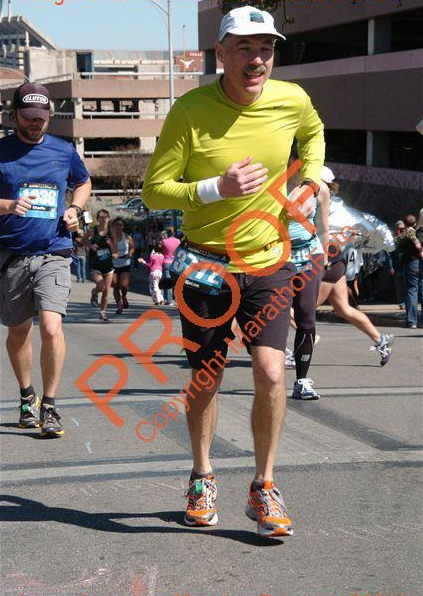 Other thoughts… outside of my worries about my calf giving out the race was really anti-climactic. It definitely went better than my previous race. I never felt at any point that I was beyond myself or my abilities. I seemed to have hit the sweet spot on training, pacing, nutrition, weather, everything. Guess the plan worked. Ps. I will probably be resurrecting my site, britri.com soon, so check it out in a week or so. I don’t have much time but will cobble something together 😉 . Fantastic write- up. Motivates me…happy way to start my day! Reminds me of running at Camp Mahn Go Tah See – Oscoda, Mi. ! Why does it say 1:38 pm, ?it is 7:39 am.